Break it all! | Valhalla, I'm coming! 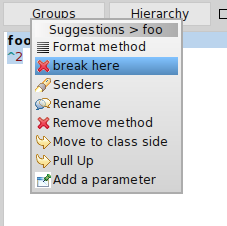 What I did was just adding a new suggestion which triggers the creation of a new breakpoint. In particular, I am interested in methods and message sends. “Break here” triggers the creation of a one shot breakpoint, that inserts a halt using Reflectivity. Eventually I am thinking of having either a submenu to choose which kind of breakpoint you want to insert or some sort of pop-up menu. Currently, you can insert two kind of breakpoints: persistent ones, and one-shot. All of them are available at message-send and method level, because they are AST based. Have a nice way to pick which kind of breakpoint you want to use. The first item is the most important to get fixed to make SmartBreakpoints “usable”. Once that is done, I will create a configuration and start asking for feedback (because the only way of full proving the tool will be getting people to use it). Pingback: SmartBreakpoints: alpha release 1.0 | Valhalla, I'm coming! I will try it during my development time, congratulations!